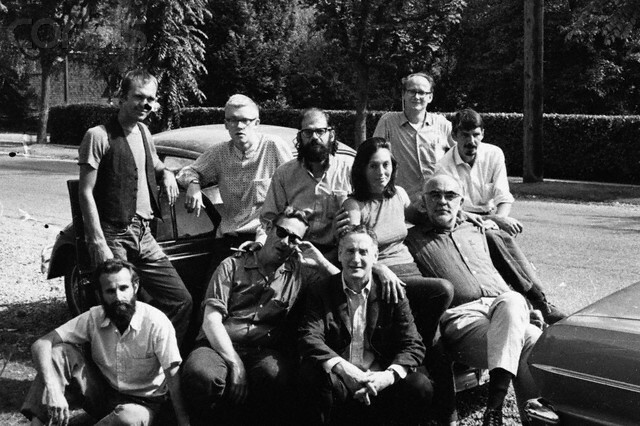 Poets gather outside the Vancouver home of Ellen and Warren Tallman in 1963. Allan Ginsberg is in the back row, third from left, standing beside a young, far-haired Dan McLeod in glasses. Warren Tallman is seated in the second row, far right. 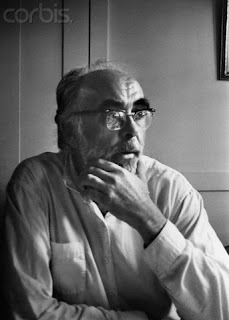 BELOW: The American poet Charles Olson in Vancouver, as photographed by Ginsberg. Allen Ginsberg, fresh from an Asian sojourn, arrived in Vancouver with his hair and beard untrimmed, ringlets cascading from his face. The poet looked like an Old Testament prophet in an age of Brylcreem conformity. He was a mad (holy) man amidst the Mad Men. It was the summer of 1963. A three-week university course brought to the grungy port city with its neon-lit streetscapes an all-star lineup of hotshot writers known as the New American Poets. George Bowering, at the time a student at the University of British Columbia who would go on to become Canada’s first poet laureate, had been reading these works for years. He intended to follow his favourite, Charles Olson. Instead, he found himself shadowing Mr. Ginsberg. The movie Howl, which takes as its title the famous poem written by the late Mr. Ginsberg, is being released on DVD this week after a limited theatrical run. The movie intersperses an interview with the poet, a reading of the poem, and a notorious obscenity trial in docudrama fashion. For some who see the movie, it is unnerving, though not unsatisfying, to see Hollywood portray characters they knew in the flesh. Stan Persky, a 69-year-old philosophy professor at Capilano University, knew many of the people portrayed in the film — Jack Kerouac (from whom he received a postcard at age 16 encouraging him in his writing), Neal Cassady, Lawrence Ferlinghetti, Peter Orlovsky (Ginsberg’s lover), and the poet himself, whom he met in 1959 while stationed with the U.S. Navy in San Francisco. Mr. Persky worked with the poet in organizing an early anti-Vietnam War protest at Berkeley, Calif. When the local Hells Angels chapter made it known they were prepared to beat the peace marchers for not being patriotic, the poet went to visit them in their compound. He returned to announce the Angels had changed their mind, offering to provide security for the protestors, an entente negotiated after the long-haired, gay poet shared with the leather-wearing bikers a supply of LSD. The 1963 visit to Vancouver coincided with several parties held at the Kerrisdale home of Ellen Tallman, a writer, and Warren Tallman, an English professor, at 2527 W. 37th Ave. The atmosphere was redolent of cigarette smoke and spilled Black Label. At one point, Mr. Ginsberg posed outside the home with the host and several poets. Among those in the photograph is Dan McLeod, who would go on to co-found the Georgia Straight underground newspaper. Some years later, the Straight faced a substantial fine for criminal libel by having awarded a “Pontius Pilate Certificate” to a judge who convicted Mr. Persky on a loitering charge. The newspaper held a benefit to raise legal funds, attracting the support of folk singer Phil Ochs and Mr. Ginsberg. In a radio interview with Jack Webster, a hard-hitting interrogator from Scotland known as the Oatmeal Savage, the gentle poet used wit and humour to disarm the host. In the end, Mr. Persky remembers Mr. Ginsberg cajoling a $50 cheque from the Scotsman. Looking back, the 1963 poetry conference is the day what we think of as the 1960s began in Vancouver. Mr. Bowering likes to tell an anecdote about the conference. At one point, the visiting poets were playing a friendly game of Monopoly at the Tallman residence. Savvy purchases and some luck with the die soon had Mr. Ginsberg demanding rent payments and calling mortgages on his fellow poets, as he ignored their entreaties for loans or leniency. The writer who decried the excesses of American capitalism was a whiz at tabletop real estate. Fred Wah recorded a reading by Allen Ginsberg during the Vancouver conference. You can hear it http://slought.org/toc/Vancouver1963/ ">here.